← “Chinatown Summer Nights” Kicks Off Saturday! Exactly two years ago, in June of 2012, “Diana, Legacy of a Princess: Royal Exhibition” went on display on the sun deck of the Queen Mary in Long Beach. After short exhibits in Kensington Palace and Bath, England, the collection brought its elegant gowns, jewelry, handwritten letters and other rare memorabilia to the ship. In keeping with the theme, the fore of the sun deck was re-purposed into a tea room. 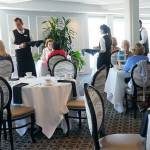 The Tea Room fits in so seamlessly with the atmosphere of the Queen Mary, it feels as if it has always been there. They hope to keep the Tea Room open even after the Princess Diana exhibit moves on in two years, because it has been such a success. 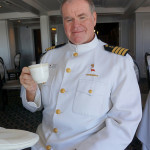 We were invited to be the guests of none other than Commodore Everette Hoard. I did not realize what a big deal that was until I saw how nervous and awestruck the servers became when he sat at our table. 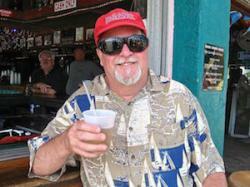 He was warm, amiable, and quite the raconteur, so we learned a lot about the ship and even its hauntings. 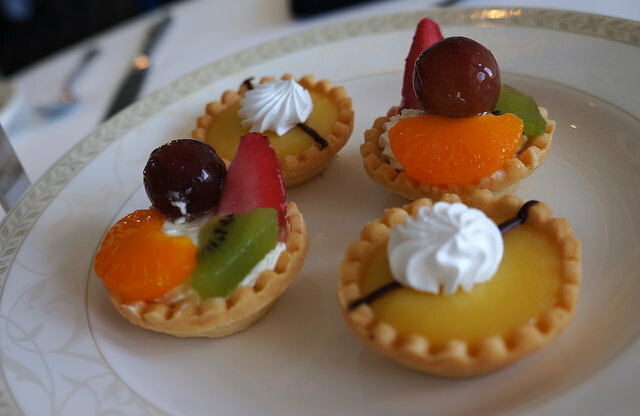 Although The Tea Room is supposed to be casual, it is still very elegant. I noticed they had carefully arranged the tables so that none of them had the sun shining directly on them, but you still had a gorgeous view of the bow of the ship and the water. 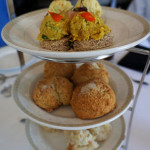 We tried the Windsor Tea ($32 per person), and there was so much food it required two of the traditional 3-tiered trays. All of the sandwiches are served open-faced, with generous portions of the fillings heaped on. The Chicken and Mango sandwich was rich with curry, yet not overpowering. The Deviled Egg Salad was very traditional, and the marble rye bread was not too pronounced for the subtle egg salad. The Sweet Water Shrimp sandwich was not the single delicate shrimp I imagined. The shrimp was finely chopped and mixed with hearts of palm and an herb dressing. It was the first time I have tried shrimp prepared like an egg salad or tuna salad, and it met with my enthusiastic approval. There were two smaller open faced sandwiches. The first was Canary Melon with Prosciutto in Pomegranate Cream. I misheard the server at first and asked, “There’s canary in that sandwich? Oh, this is fancy!” Hey, they served me duck tongues at The London Hotel, so you just never know. The melon and prosciutto was an unexpected modern twist on the tea sandwich, more like a canapé, and it was a refreshing change of pace. 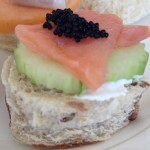 The Salmon Gravlax, English Cucumber and caviar sandwich also resembled a canapé, and elevated the tea to something a little more gourmet than the usual. The Windsor Tea also comes with two scones per person. 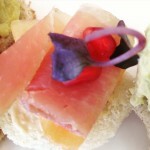 They are accompanied by clotted cream and a variety of curds and jellies. After one scone we leaned back, sated. I have rarely finished a tea feeling quite so full. And then came the dessert tray! I had completely forgotten. 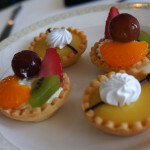 The dishes held miniature eclairs, little opera cakes, elderflower raspberry cakes, lemon tartlettes and fruit tartletts. 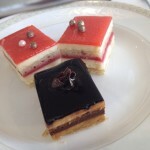 Out of all of the pastries, we enjoyed the opera cake the most. I would even eat a giant one. The making of a proper pot of British tea is second only in precision to the Japanese tea ceremony. You have to rinse the tea pot with hot water, carefully measure the loose tea, pour in scalding hot boiling water — there is more to it than you would think. The Queen Mary appeared to have it right, and were gracious when my mother produced her own tea bag from a silver case she carries with her since her health allows her only certain teas. 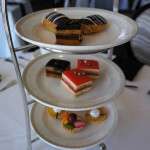 If you are only a little peckish, or just want to enjoy the ritual of high tea, I would recommend the “Lite Tea” with 2 sandwiches of your choosing, scones, a petite eclair, lemon tart and opera cake ($25 per person). There is also the “Guil-tea Pleasure” with a glass of wine, a variety of small plates with cheeses and meats, olives and the like, plus scones ($32 for two guests). If you are curious as to how much sugar the human body can handle, you could try the “Chocolate & Bubbles for Two,” with a S’mores Pop, Petit Cupcake, Opera Cake, Petit Eclair, Chocolate Macaroons, Scones, and a glass of sparkling wine or cider ($30). If you would like to treat your little prince or princess to a special day, there is the Little Royal Tea with child-friendly sandwiches like Ham, Cheese and Tomato, Turkey and Cucumber, Peanut Butter and Jam, and Strawberry with Hazelnut Chocolate. It also includes a miniature cupcake, a cake pop and a French macaroon, plus the ubiquitous scone. There is no reason to wait for a holiday. Make your own special day with your mother, your children, or anyone who has been a positive influence in your life. Make your memories now. The room practically screams, “Bring your mother here!” I know I did. Tea is served Thursday through Sunday from 11am until 4pm. Reservations are required. There is also a special offer that combines entry into the Princess Diana Exhibit with a “Lite Tea” in The Tea Room. Validated parking is $8. You may have to pay the $15 entry fee to board the ship, but if you give the receipt to your server, it will be deducted from your bill. This entry was posted in Attractions, Food. Bookmark the permalink. 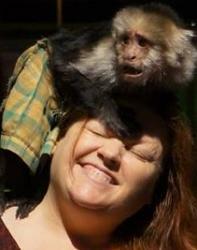 Looks like a marvelous time was had by all!